The pathogenicity of Alternaria spp. on Malus Ã— domestica in New Zealand has not been investigated fully. Alternaria spp. were isolated from necrotic spots on leaves and fruit rots from various apple cultivars. Pathogenicity of 31 Alternaria spp. isolates was tested on excised ‘Royal Gala’, ‘Golden Delicious’ and ‘Scifresh’ leaves (wounded and unwounded) by measuring lesion diameters. Viability of Alternaria spp. grown from infected leaf material was assessed to compare various storage conditions. Alternaria spp. were consistently isolated from the central brown area of leaf lesions but could not be isolated from outside the leading edge or from the purple region surrounding the lesion. All isolates produced lesions on wounded leaves. Most isolates showed some pathogenicity on at least one cultivar, with lesions on unwounded leaves. Lesions on leaf material caused by Alternaria spp. can be stored for at least 11 weeks by freeze-drying or air-drying leaf material and storing at 0.5Â°C or room temperature. Some New Zealand Alternaria spp. isolates on Malus Ã— domestica are pathogenic on fruit and leaves. 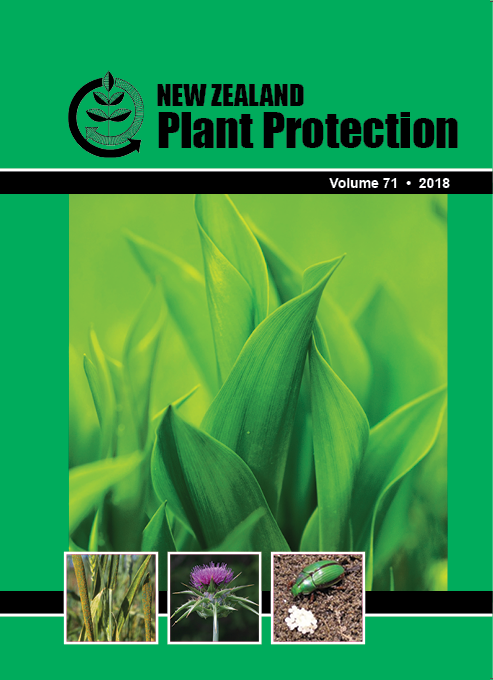 Further studies are needed to better understand the biology of this pathogen in New Zealand and determine a suitable control programme.